London Transport had a policy in its Central Bus Department of operating double-deck buses wherever possible. LT's remit included making a profit, and it was always therefore very focussed on the most efficient means of operation. Obviously carrying 56 passengers (on an STL or RT) was a more efficient use of a crew of two than running a 35-(LT Scooter) or 41-(RF) seat single-decker, although lightly trafficked routes had the option of one man operation up to 1949. 1952 - old and new. 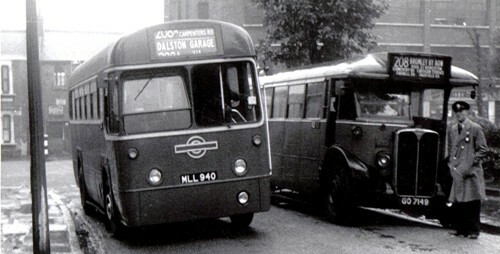 The 208 and 208A, Dalston's East End single-deck routes, were among the first to use the new RF class and the last home of the LT Scooters dating from 1931. In the period between conversion of the 208A and the 208, the first RF on the route and on its fifth day in service, RF303 (later renumbered as RF522) passes Scooter LT1093 at Clapton Pond on 13 October 1952. In three months time, there would be no more Scooters operating in London. The RF driver has however made an start on the incorrect blind displays that were a feature of the Dalston RFs. As a result, the single-deck fleet only ever represented less than 10% of the total motor buses operated in the Central Area, less than 5% after the end of the trolleybuses, with compelling reasons (usually height or weight restrictions, or development routes) for their use. The sense that single-deck routes were 'special' was reinforced in 1934 when, on adopting a new route-numbering system, they were allocated a separate series of numbers commencing at 200. Although eroded during the second world war, this numbering scheme remained notable until the large-scale changes brought about by modern one-man buses in the Reshaping Plan of 1968. This section of the site will be developed to look at this period of red single-deck bus operation in London, including a summary of routes by area. 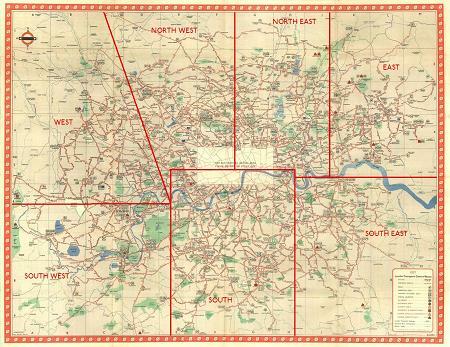 The area pages cover London split approximately as shown on the key (areas not clickable separately).